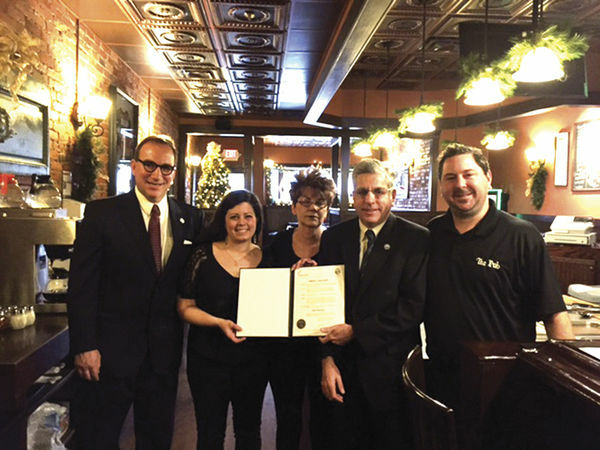 In recognition of The Pub’s enduring presence in downtown Jamestown for the past five decades, Mayor Sam Teresi decreed that Monday, Dec. 14, be known as “The Pub Day” within the city. The establishment has been a fixture at 209 N. Main St. since it first opened its doors for business on Dec. 13, 1965, when local resident Jim McCusker started the business after retiring from playing in the National Football League the year before. McCusker’s goal was to provide great service, food and drinks in a friendly atmosphere. The mission to make sure all customers, new and old, leave happy and full has been a success ever since; a sentiment shared by Teresi following the reading of his proclamation. In addition to its success from a business standpoint, The Pub has also come to be identified with perseverance after it was heavily damaged in a fire that occurred in January 2014. Following a lengthy and involved renovation process, which was bolstered by an immense outpouring of community support, The Pub reopened for business on July 22, 2014, to the delight of hundreds of downtown patrons. More than $350,000 went into renovating the business, with $76,000 from the city, which was used for handicapped accessibility in the bathrooms and doorways. The Jamestown Renaissance Corporation, through its Downtown Block Cluster Program, funded $40,000 for interior reconstruction, heating, ventilation and air conditioning, and some of the $40,000 also went toward a sprinkler system and for a new facade for both The Pub and Lisciandro’s Restaurant. Lisciandro’s, which neighbors The Pub, also sustained damage from the fire, but reopened on Jan. 22. The business is currently owned by McCusker’s wife, Mary, who co-owned the business with Jim until his death in February. Mary McCusker said the city’s observance of The Pub’s 50th anniversary is especially meaningful because, she admits, she initially had doubts as to whether the business would reopen in the aftermath of last year’s fire.